Lucknow: The Department of Health of the Uttar Pradesh Government has confirmed filing two separate caveats before the Allahabad and Lucknow benches of the state high court against the Gorakhpur-based BRD Medical College for medical negligence on August 10. The state health department said that it was fully aware and vigilant about the August 10 incident at the Baba Raghav Das Medical College, which resulted in the deaths of over 33 children due to lack of oxygen supply to the wards. In this case, the college principal, after filing a case against nine people, including his wife, filed caveats before the two benches of the state high court on the instructions of the health department. Gorakhpur Police has reportedly begun the probe under the supervision of Deputy Superintendent of Police Abhisek Kumar Singh. So far, in the last 48 hours, police have collected documents and records from the principal’s office, seized records of employees named in the case that was filed at the Hazratganj police station here on the night of August 23. The investigation team will summon the accused for interrogation soon. Once the probe is completed, a charge sheet will be filed against the accused, a majority of whom have gone underground. The probe team headed by Uttar Pradesh Chief Secretary Rajiv Kumar. It has been ascertained that former principal Dr. Rajiv Mishra and employees of the medical college did not clear dues of the oxygen supplier, Pushpa Sales Private Limited, and allowed Rs 2.50 crore fund to lapse. Kickbacks were allegedly the main reason for delay in clearance of arrears, it was alleged. Despite being aware of the oxygen crisis in the hospital, Dr Mishra went on leave without informing senior officers in the medical education department. Head of the department of anaesthesia Dr Satish Kumar, who was in-charge of the oxygen supply, too went on leave. Dr Kafeel Khan, the then nodal officer of the encephalitis ward, was found involved in private practice and used the media to misguide the medical education department officers after the death of the children, according to the FIR. A case has been filed under Sections 409, 308, 120 (b) and 420 of the Indian Penal Code (IPC), besides Section 7/13 of the Prevention of Corruption Act and Section 15 of the Indian Medical Council Act. 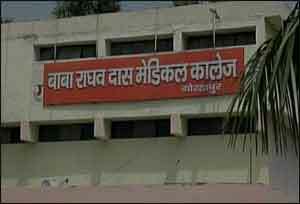 The case is presently being handled by the Gulhariya police station in Gorakhpur.